Open Sky Group periodically hosts guest blog posts to help share information on technologies and offerings within the supply chain that are outside of Open Sky service offering areas; ones that we think will be of interest/use to our customers. 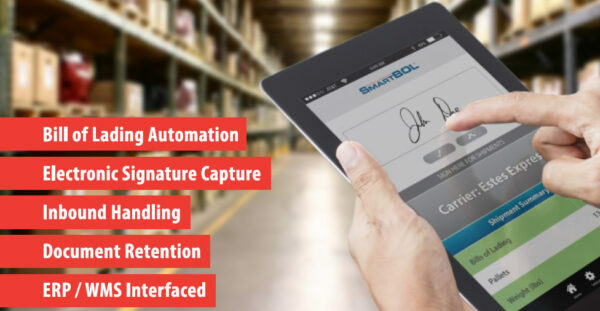 Here are some case studies from SmartBOL illustrating how the solution was used across several industries (3PL, Consumer Goods, Frozen Foods and Government). Driver electronic signature capture, time and cost savings and customer-accessible documents were common themes across these projects. These solutions plug into ERP and WMS to reuse existing data, create shipping documents and streamline inbound shipment handling processes. It has a generic document creation engine that allows quick document addition or modification. It also offers functionality to capture signatures electronically and trigger an event in another system, and create electronic receipts for inbound goods. It further enables the user to attach documents or photos as proof of receipt or damage. Additional features include document preview on a tablet and save signed document images into the SmartBOL Document Repository or another document management system. For more information, visit ADi’s website, call 732-981-0444 ext. 304 or email. ADi, a New Jersey-based U.S. corporation with headquarters in Piscataway, New Jersey, has been developing SmartBOL products for more than 11 years and has over 1,700 customers in USA and Canada. SmartBOL is a registered trademark of ADi Data International Inc.